Revised and updated with the latest scientific research and updated case studies, the business classic that offers a revealing look at psychopaths in the workplace-how to spot their destructive behavior and stop them from creating chaos in the modern corporate organization. All of us at some point have-or will-come into contact with psychopathic individuals. The danger they present may not be readily apparent because of their ability to charm, deceive, and manipulate. Although not necessarily criminal, their self-serving nature frequently is destructive to the organizations that employ them. So how can we protect ourselves and our organizations in a business climate that offers the perfect conditions for psychopaths to thrive? Dr. Babiak and Dr. Hare reveal the secret lives of psychopaths, explain the ways in which they manipulate and deceive, and help you to see through their games. 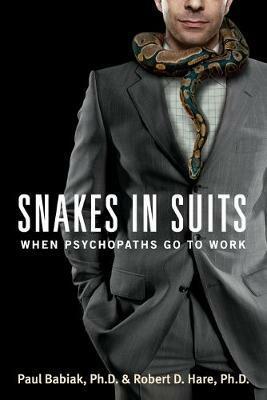 The rapid pace of today's corporate environment provides the perfect breeding ground for these "snakes in suits" and this newly revised and updated classic gives you the insight, information, and power to protect yourself and your company before it's too late. Robert D. Hare, Ph.D., is the author of Without Conscience and the creator of the standard tool for diagnosing psychopathy. He is an emeritus professor of psychology at the University of British Columbia, and president of Darkstone Research Group, a forensic research and consulting firm. He has won numerous awards for his research, lectures widely on psychopathy, and consults with law enforcement organizations, including the FBI. He lives in Vancouver, British Columbia, with his wife.